Sergei Naryshkin speaks to the media at the Parliamentary Assembly of the Black Sea Economic Cooperation, in Bucharest, Romania, November 27, 2015. Vladimir Putin has appointed a new head of the Foreign Intelligence Service. The country's top spy is now former speaker of parliament and long-time friend of the president, Sergei Naryshkin. Observers discuss the appointment and ask whether Naryshkin will try to elevate the reconnaissance network to a new level. Russian President Vladimir Putin has once again made a staff reshuffle, dismissing his old St. Petersburg ally Sergei Naryshkin from the post of State Duma Speaker on Sept. 22 and appointing him director of the Foreign Intelligence Service (SVR). Little is known about this structure and many observers even say that its directorship does not require much involvement in intelligence activity. Mikhail Fradkov, who headed the service for almost nine years, is a vivid example: Before coming to the service, he had no relation to intelligence whatsoever. Naryshkin's case, however, is slightly different: He is the fourth person in Russian politics who has returned to where he started. According to unofficial information, the former Duma speaker served in the KGB's First Chief Directorate in the 1970s. The directorate was responsible for foreign intelligence and later branched off into a separate service, the SVR. Naryshkin's transference to intelligence may be an attempt by Putin to strengthen the SVR or just an honorable sinecure with an admirable salary. Judging by fiscal declarations, last year the SVR director's salary was the most impressive among special service heads (20,317 rubles, or $319,000). According to the presidential decree, Fradkov resigned "due to his retirement” and will now head the executive board of Russian Railways. But there are also other observations. Slon Magazine writes that in the last months the Kremlin has been receiving complaints about the head of the SVR. They concerned the service's work and "possibly the service's extremely optimistic reports on negotiations between the EU and the U.S. on free trade." According to the Russian business daily Kommersant, many within the SVR saw the necessity of renewing the top managing personnel and of carrying out internal reforms. There have been frequent scandals involving Russian spies and memories of 2010, when the service experienced the greatest debacle in its history, are still fresh. In that year the FBI extradited 10 “deep cover” agents and 80 more agents could have been exposed, as well as the entire intelligence gathering system. Unlike the unseasoned Fradkov, Naryshkin, who is not indifferent to intelligence matters, is a more suitable figure, says president of the independent Institute of National Strategy Mikhail Remizov. "He is capable of strengthening the position he will occupy, since he is part of the highest league of Russian politics and the president's closest circle. He also has a good track record in this field," explained Remizov. In Remizov's opinion, it should also be considered that in the existing relations with the West, the SVR is changing its priorities. It is becoming critically important to work in the manner of Britain’s Intelligence Service, combining comprehensive threat analysis and quality processing of the data obtained. "It is absolutely certain that now the SVR must be the key structure, one that forms a cognitive map of the world and thus, Russia's political strategy." Although Naryshkin is considered "our man" in the SVR, for his career this appointment may actually be a demotion, according to Alexei Zudin, a member of the expert council at the Institute of Social-Economic and Political Studies. In essence, the SVR head's real position in the table of ranks is not that high. Until the very last moment Naryshkin himself called his transference to intelligence "speculation," participated in the State Duma elections (held on Sept. 18) and said that he "doesn't intend to step down." The Gazeta.ru publication notes that the appointment implies that Naryshkin's work in the Duma was appreciated, even though, while being a good administrator, he was not a brilliant politician. In the view of Lieutenant General Nikolai Leonov from the FSB's foreign intelligence directorate, moving Naryshkin to the SVR is a "purely political appointment." "This is natural and understandable. Because the head of state must have as the director of the SVR a person he fully trusts. Moreover, Naryshkin has lots of experience in governmental and political work and his candidature will not raise any objections," said Leonov. Alexei Zudin thinks that it is still unclear whether Naryshkin will remain a purely political appointee or he will get involved in the SVR as a reformer. Fradkov was a political appointee. 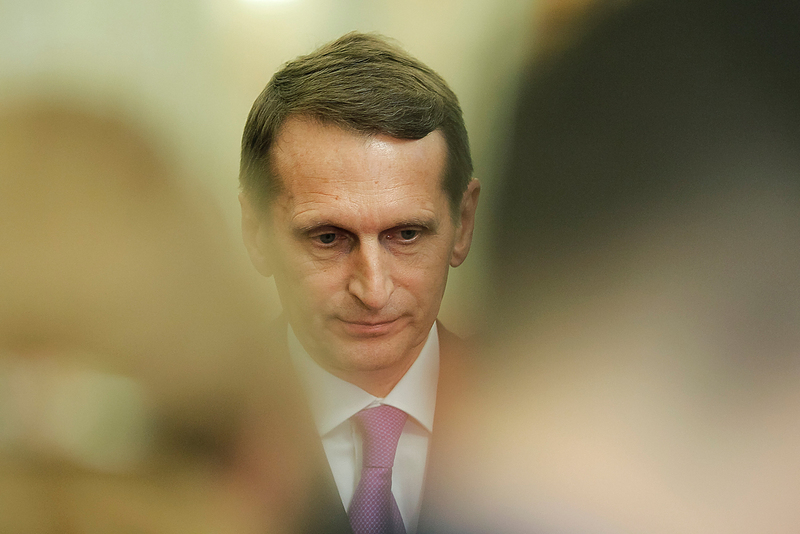 But Naryshkin's fate is ambiguous: If rumors of the creation of the Ministry of State Security (a structure that will absorb all the other security agencies, including the SVR) under the aegis of the FSB become reality, Naryshkin will most likely lose out: "The ministry will already have its own director," said Zudin. But Remizov is convinced that directing the intelligence service is not a sinecure. In the next few days Naryshkin's replacement at the State Duma will be announced. The number one candidate is the current deputy head of the presidential administration, the Kremlin's “éminence grise,” Vyacheslav Volodin. A native of St. Petersburg, Naryshkin graduated from the St. Petersburg International Management Institute as an economist. In the beginning of the 1990s he worked with Putin at the mayor's office and then in the government of the Leningrad Region. In 2004 Naryshkin moved to Moscow and immediately his career took off: First he became deputy director of the economic department of the Russian presidential administration and shortly afterward chief of staff of Fradkov's government. He was also deputy prime minister and in 2008 headed President Dmitry Medvedev's administration.In 2011 he was appointed to the position of State Duma Speaker when the United Russia Party lost its constitutional majority in the lower house elections. At the 2016 Duma elections he was re-elected to his position and United Russia regained its majority.